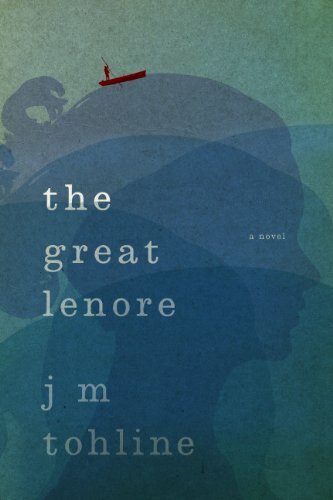 J. M. Tohline’s first novel, The Great Lenore, is a beautiful book. It is beautiful in the same way that J. D. Salinger’s books are beautiful. Lyrical without being pretentious or self absorbed, melodic without being baroque, it is refreshing in the same way a fortunate musical composition hangs in your consciousness after the last note has sounded, making it impossible for long moments to think. One just feels. The main plot device is that of the title character, whom everyone thinks is dead, coming back to secretly attend her own funeral and find out what everyone really thought of her, particularly her husband whom she knows has been cheating on her. She wants to know how long it will take him to find solace in the other woman’s arms before she quietly leaves that hypocritical and narcissistic high society life behind her. Mr. Tohline goes on to introduce the title character. The Atlantic stretched out behind her like an angry black sheet. The rain chased itself into the water. Her eyes kissed mine as she brushed past me. Lenore is—or was until the airplane that was supposedly taking her back home to her native London went down in the Atlantic—a part of that household having married its oldest son, Chas Montana, a faithless bounder if there ever was one. Other characters that populate the palace are Richard’s close friend Maxwell, Chas’s brother, but as unlike him as possible. While Maxwell is a highly intelligent stoner, Chas is less intelligent but far more ambitious and thus is less a disappointment to their father. Another member of the household though not the family is Jez, not blood kin, but alike in spirit to the patriarch who considers him like another son. Jez is GQ perfect in every way, and Richard takes an immediate dislike to him. All three of these young men have one thing in common: they are all in love with Lenore. Completing the roster of siblings and quasi siblings is Cecilia. Richard takes an immediate liking to her and fortunately for him she is kind enough to return his attentions. The head of the concern euphemistically called a family, is a man known to us only as “Mr. Montana,” an affectation that we can only assume makes him more remote, more an abstraction that a real man. Mr. Montana is described as “two dimensional, and those two dimensions were: Himself and His Money.” He is married to a woman known only as “Mama Montana” and it is she who, having learned that Richard was spending Thanksgiving alone next door, insisted he come to the palace for dinner. If these characters seem rather stereotypical, they are still presented with great clarity seen through the perceptions of the narrator. If they seem shallow it is only because he thinks them so. Exceptions are his friends, Maxwell and Cecilia, whom he gets to know rather intimately. As the novel progresses, he gets to know others rather less intimately yet enough to take the stereotypical veneer off of them. The biggest surprise is the depth of feeling in Jez who at first appeared to be no more than a picture perfect sycophant, but with whom Richard forms an oddly close friendship. It is at the Mama Montana mandated Thanksgiving dinner that Richard first learns of the great Lenore. Everybody loves Lenore with a fervor usually reserved for movie queens or saints. Only Chas’s mistress can hold anything against her. She is one of those people who draw affection and reverence like a candle flame draws moths, effortlessly, perhaps even unconsciously. She does leave a trail of broken hearts behind her either because she cannot return their love or because she doesn’t know of it since it is never expressed to her, but she never intends to hurt anyone. The intricate and convoluted relationships within the Montana family have one thing in common: the varying strands of expectation, regret, disappointment, and possessiveness all wind about the character of Lenore. When everyone thinks she has died, their adoration becomes a form of worship. That Lenore is not on the bottom of the Atlantic is pure luck. She had forgotten an item of great sentimental value, a miniature punt boat given to her by one of the young men whose name will not be revealed here, and which is not coincidentally a huge plot device, and had gotten off the plane to get it. The plane took off and fell into the ocean. Because her name was on the manifest as having boarded, everyone assumed that Lenore was dead. It is at this point that they respond not so much to the death of an individual, but rather to the death of their expectations of her, their image of her, an image that had threatened to bury the true Lenore. It is this stultifying life wherein Lenore finds herself increasingly alienated from herself that she Attempts to leave behind her under cover of her perceived death. She wants to quietly slip back to England and become the woman she once was and the woman she intended to be. But before she does, she must know what the Montana family really thinks of her. Her brush with death has changed her. She will no longer live any life but her own. When we do finally get to know Lenore, she is something of a disappointment. Lovely, to be sure, sprightly and smart, longing to live life to the fullest, denying herself little in her pursuit of happiness, yet she does seem to the objective observer to be quite ordinary. One senses that she is, like many extraordinarily beautiful women, a blank slate upon which all who know her can write their own desires and fantasies. This may be the whole point of the book. That people who so adore Lenore can’t seem to do what is needed to have her. The narrative moves seamlessly between past and present, like different movements in the same symphony. Events are presented out of sequence, governed by the demands of the action rather than holding to the dictates of plot. Only sometimes are we unsure of where and when the action is taking place, but that occasional ambiguity is intended; the give and take between disorientation and certainty, between past and present, gives the novel its rhythm and melody and a great deal of its beauty. I went outside that final night on the island, and I laid in the sand with an open sky above me and a wind dancing into me. The waves hit the sand and ran forward before falling back upon themselves and starting over again. The incessant beauty of existence . . . This is a place for dreams. The characters are diverse and troubled, charming and despicable, self absorbed and loving, as filled with contrasts as the polarized Nantucket landscape where palatial aristocratic mansions vie with the rugged natural woodland and shoreline, a place, an island, where each person is, in his or her own way, alone.